Segment from a surveillance video of the home invasion in Vista that allegedly depicts Joe Colin Crowder Jr. Courtesy SD Sheriff’s Dept. A man already in jail on unrelated charges will face a slate of additional criminal counts for allegedly breaking into and looting a house near Shadowridge Golf Club, then threatening to kill the homeowners before driving off in their car, authorities said Friday. Joe Colin Crowder Jr., 50, allegedly forced entry to the residence in the 2400 block of Links Way in Vista through a rear sliding glass door shortly after 5 a.m. last Sunday, according to sheriff’s officials. About 45 minutes later, a man who lives in the home confronted Crowder in the kitchen, Sgt. Dustin Lopez said. After the suspect allegedly threatened his life, the victim ran back into his bedroom and told his wife to call 911. 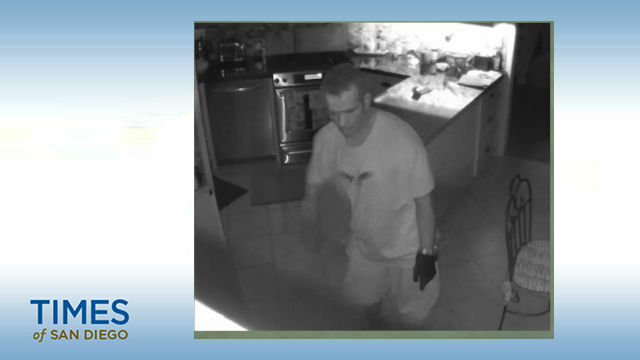 The intruder then grabbed a set of keys from a counter, ran into the couple’s garage and got into their Toyota Avalon. Before fleeing in the car with the man’s wallet, the woman’s purse and some electronic devices, Crowder allegedly made several more threats about killing them, Lopez said. The victims’ vehicle was later found abandoned in Oceanside with some of the stolen items inside. San Diego County Crime Stoppers subsequently released high-definition video footage of the burglar captured by a surveillance system in the victims’ home. Escondido police detectives then saw the images and recognized the man as a suspect they had arrested the day after the Vista break-in, according to Lopez. Crowder was booked early Tuesday morning in connection with theft-related crimes in Carlsbad, Escondido and Valley Center, the sergeant said. The suspect’s next court appearance is scheduled for Oct. 28.